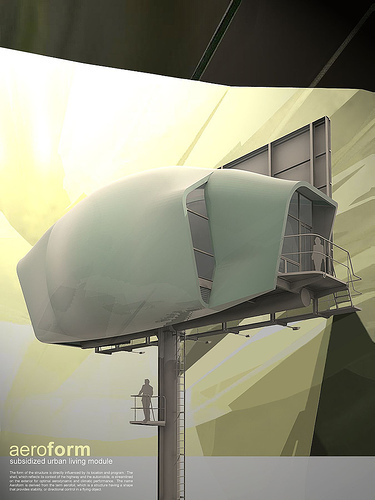 This interesting little tiny home is built on the top of a billboard support. I find it interesting, since just the other day (being the alternative housing nut that I am)… I looked at a billboard with the surrounding platform and thought to myself, that would be a cool place to put a tiny house… as long as you didn’t have to climb to the top with an armload of groceries. And voila! Someone else has already developed that idea into this cocoon-shaped house. Kinda cool. See a larger version of this house on Flickr.com.